The way I watch old films is like this – a) it’s nostalgia – I’ve watched this before, and I come across it again when I’ve nothing else to do b) I’ve heard of the film but have never watched it, and either YouTube throws it up on the sidebar piquing my curiosity, or one of my fellow-bloggers posts a review recommending it, or c) I – as bollyviewer once put it – follow a great song into a bad movie. This post is a result of option C. It was Shamshad Begum’s ‘Saiyyan dil mein aana re’ that caused my downfall. I love the song, and since Bahar was Vyjayanthimala’s debut in Hindi (she reprised her role from the Tamil original Vaazhkai), and I really like Vyjayanthimala, I actually went looking for the film. Much to my dismay – in hindsight – I found it. Before I get to what I thought about it (if you haven’t already guessed), onwards to the saga of an ideal Hindi film heroine (with many asides, and exlamation points). A story of two pairs of lovers, Bahar begins with Lata (Vyjayanthimala) and 'Ashok' (Karan Dewan) bumping – literally – into each other. They take an instant dislike to each other which, of course, in filmi parlance means they are going to fall in love. Lata is the darling daughter of Chaudhary Govardhanlal Patwardhanlal (Om Prakash), a college lecturer. Her step-mother (Indira Acharya? ), while not too step-motherly, is not very keen on girls studying further (Lata is in college) and would prefer to see Lata married off to her nephew, Shekhar (Pran). Meanwhile, a reluctant Shekhar is sent off to their village by his aunt – his grandfather has been asking for him. While there, he chances upon a village maiden (Pandhari Bai) – who, in the long tradition of Hindi film village girls, is oh-so-cute [and barfworthy]. Malti (the aforementioned village girl) lives in the neighbouring house, and is friends with Shashi (Baby Tabassum), Shekhar's niece – a fact that Shekhar uses to his advantage. Malti is poor, and her parents are beholden to a wealthy zamindar from whom her father has taken a loan that he’s unable to repay. 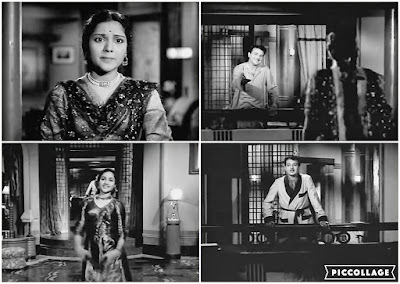 The zamindar, long in tooth as he is, spies Malti whom he hasn’t seen since she was a little girl, and stumbles upon a perfect solution – marry Malti to him, and he will forgive the loan. Shekhar, meanwhile, is busy trying to charm Malti. Initially hesitant, Malti soon melts under his continued friendliness and promises of fidelity. Malti’s father, unable to resolve his financial problems, is forced to accept the zamindar’s offer. A shaken Malti, now head over heels in love with Shekhar, is pinning all her hopes on Shekhar’s promise to rescue her. Back in the city, ‘Ashok’ – you haven’t forgotten him, have you? [wouldn’t blame you if you had – it seems like the story is more about Malti and Shekhar than Lata and Ashok] – whose real name is Vasant Kumar, meanwhile, has just moved into the house next door to Lata’s. [Where would Hindi films be without coincidences?] Lata and he continue to irritate each other – his tabla playing incenses her [at 10p.m. – I don’t blame her! ], but he gets his own back when she decides to dance around the same time another day. You know where this is going, right? Meanwhile, Shekhar’s sojourn in the village has come to an end, and he happily leaves, promising to return in a month’s time. He will settle all their debts, he promises, and marry Malti then. However, one month turns into three, and Shekhar shows no sign of returning. Back in the village – surprise! – Malti discovers she’s pregnant. [Unmarried Hindi film heroines are remarkably fecund.] Her mother (Leela Mishra) is aghast – what are they going to do now? Shekhar, meanwhile, unknowing and uncaring of having left a broken heart in his wake, is still pursuing Lata, co-opting his aunt in his endeavours. It doesn’t seem to help much, actually. Very unusually for a filmi father, Chaudhary Govardhanlal is adamant that his daughter will choose her own husband. Said daughter doesn’t seem to be choosing Shekhar. In another blow to Shekhar’s plans, Kumar turns out to be the son of an old college friend of Chaudhary Govardhanlal. And the stage is set for Lata to fall in love with him – especially when she realises that 'Ashok' and Kumar are one and the same. Soon, they are billing and cooing to each other. 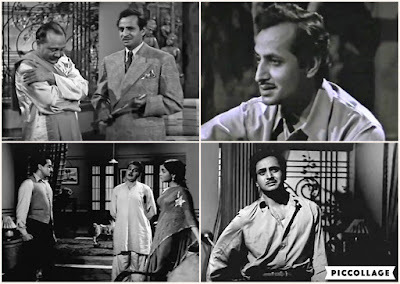 All this while, Malti has been continually searching for Shekhar (the passing of time is indicated by a film poster – aptly named ‘Chhod Gaye Baalam’ – outside a theatre that marks how many weeks it has been running); obviously, not knowing anything about Shekhar, not even his last name, the poor woman is at the end of her tether, and decides to do what she’d intended to do several months earlier – commit suicide. The local postman, who arrives to find a harried Kumar trying to calm a bawling baby, jumps to the conclusion that Kumar’s family has returned to town. For Shekhar, who spots Kumar and the baby when he’s visiting his aunt (and trying to wile his way into Lata’s heart), this news comes as manna from heaven. So, what will happen to the Kumar-Lata romance now that Kumar is supposed to have fathered a child? Has Malti finally met her end? [I wish!] Will Shekhar get his comeuppance? As if you don’t already know the answers. 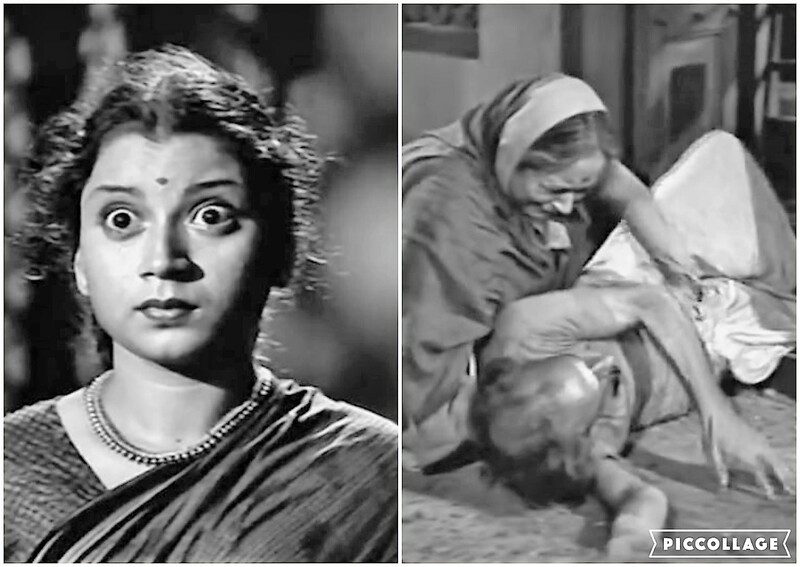 Apart from the absolutely inane plot, Pandhari Bai’s theatrical acting – she had a total of three and a half expressions, and all of them consisted of widening her eyes in different ways – was abysmal and made me want to cut my throat several times. [Why did I continue watching? I’m a masochist – what can I say?] Karan Dewan is a cipher; I can’t believe the man was a ‘Jubilee Star’ (long before Rajendra Kumar was handed that tag). He’s – well, not bad, but totally insipid; he just has the personality of a dead fish. The brightest spot? Vyjayanthimala – and the songs by SD Burman. All of 16 when the film released, Vyjayanthimala was not only pretty and cute (and could emote), but she showcased several scintillating dances, which became de rigeur for a Hindi film heroine. It was a fantastic debut, and the beginning of a long and successful career. SD Burman’s music. The cause of my downfall. Apart from Saiyyan dil mein aana re, there were Qasoor aapka (in two versions), Aaja pardesiya, Pyar ki bahaar leke, etc. This was one SD score that depended largely on Shamshad Begum, Geeta Dutt coming in only for two solos (as the voice of Pandhari Bai), and Kishore and Talat doing the male honours (one solo each).